WILDWOOD-Morey’s Piers will host the Sticks in the Sand Beach Hockey Tournament and the Sand Slam Beach Lacrosse Tournament on the Wildwood Beach between Schellenger and Juniper Avenues Saturday, July 21 and Sunday, July 22. Beach Hockey games will be 5v5, with four players on the field plus a goalie, with a maximum of 10 players per team. Games are 25 minutes each with a running clock. Fields are 30 yards by 50 yards. Each team will play a minimum of 5 games (weather and unforeseen conditions permitting). Divisions include U19 (includes HS Varsity), U16 (includes HS junior varsity), U14 Women’s Open and Co-Ed Open. Beach hockey is played with a rubberized ball which is slightly larger than a regular field hockey ball. 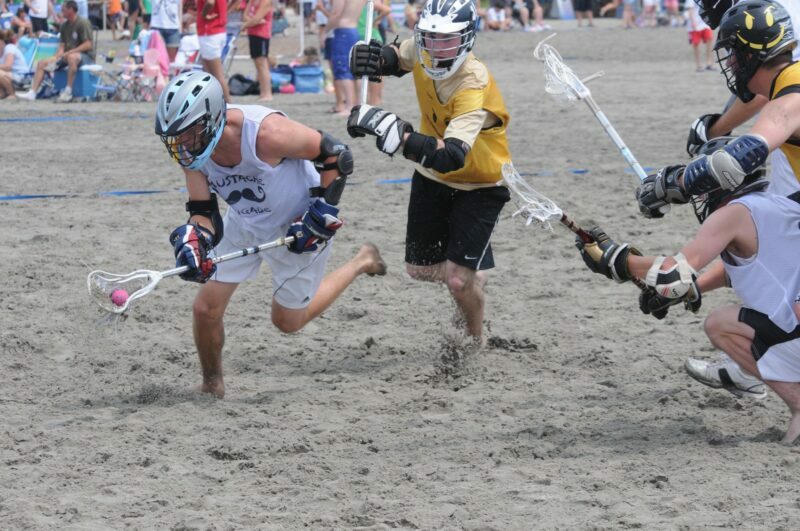 Beach Lacrosse games will be 5v5, with 4 field players plus a goalie, with a maximum of 10 players per team. Each game will have two 18-minute halves with a four-minute break. Each team will play a minimum of three games. Divisions will run from Boy’s & Girl’s U10 – U18, Adult Men’s & Women’s Open. Teams will compete on the beaches of the Wildwoods and enjoy the water parks during the day and the famous Wildwood boardwalk and amusements in the evening. As part of their registration fee, each team will receive 10 Morey’s Piers Amusement and Water Park passes good for unlimited access to both Ocean Oasis and Raging Waters Beachfront water parks, plus unlimited rides on all three Amusement Piers all weekend long! Registered teams will also be provided access to exclusive deals of approximately 70% off additional three-day wristbands. For additional information or to register for the Sticks in the Sand Beach Hockey Tournament or the Sand Slam Beach Lacrosse Tournament visit www.MoreysPiers.com or call 609-522-3900.